What happens when a cigar giant like Altadis U.S.A. Inc. collaborates with a small producer like Boutique Blends? 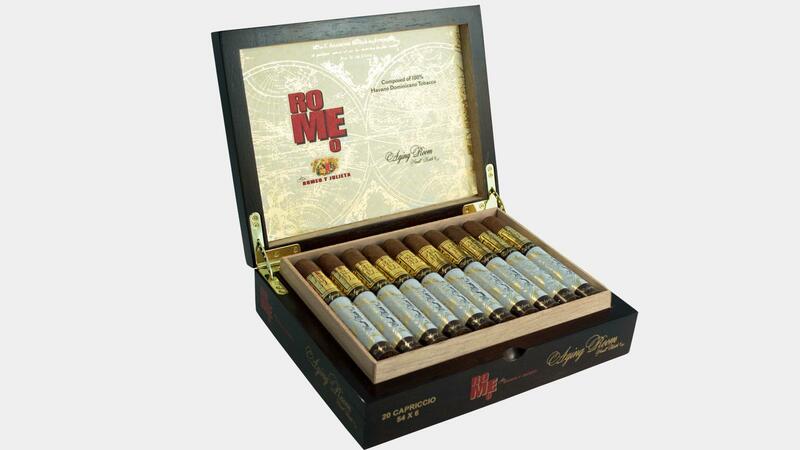 The answer is the Romeo by Romeo y Julieta Aging Room, and it's going to hit cigar shops in May. In this experimental, limited-edition project, Altadis has given Boutique Blends owner Rafael Nodal the opportunity to create his own small-batch interpretation of the very large Romeo y Julieta brand. Nodal has done so by drawing upon the libraries of aged and distinctive Dominican tobaccos grown and archived by José "Jochy" Blanco, tobacco grower and owner of Tabacalera La Palma in the Dominican Republic. "It is unbelievable that I can work with one of the biggest brands in the word," said Nodal to Cigar Aficionado. "When I created the blend for this cigar, I really had to consider the history of the Romeo y Julieta brand and appeal to its classic elements by making it as refined as possible." Subtitled as Small Batch F25, the Romeo by Romeo y Julieta Aging Room is a Dominican puro using predominantly Cuban-seed tobaccos cultivated in the Dominican Republic's Cibao Valley. These cigars are being rolled at Tabacalera La Palma. "Some of the areas in the Cibao Valley have the deepest topsoil in the world," said Nodal. "It produces very distinct tobacco. In terms of collaboration, the Romeo Aging Room follows in the footsteps of Espada by Montecristo, which was made in Nicaragua for Altadis by Nestor Plasencia. But I'm a lot smaller than the Plasencias." Nodal said that there were strict guidelines to follow during the creation of this brand. Even though they're made at La Palma, Altadis still sent supervisors to oversee production, ensuring certain quality-control criteria were met. "I'm very excited about the Romeo by Romeo y Julieta Aging Room project and the collaboration with Rafael and our respective teams," said Javier Estades, general manager of premium cigars for Altadis U.S.A. "It's a great opportunity for Romeo to continue to offer new and innovative offerings to the market." The new Romeos will come in three sizes: Copla, which measures 5 inches by 48 ring gauge; Capriccio, 6 by 54; and Cantaor, a 6 by 52 belicoso. Like Nodal's previous Aging Room brands, the sizes are named for musical terms. Packaged in boxes of 20, these smokes are set to retail between $11.50 to $12.50 per cigar. Production will stop at 250,000 cigars. According to Nodal, once that number is reached, the project is over. Though the cigars are made at La Palma, where the rest of Nodal's Aging Room brands are produced, the Romeo Aging Room is distributed by Altadis.